The Stirling Smith Art Gallery and Museum > Collections > Volunteering > The Isle of Iona – a special place even with the weather! The Isle of Iona – a special place even with the weather! With the holiday season now in full swing I thought that this image would be most appropriate. The photograph in this Blog entry was taken at one of my favourite places in Scotland, the Isle of Iona. 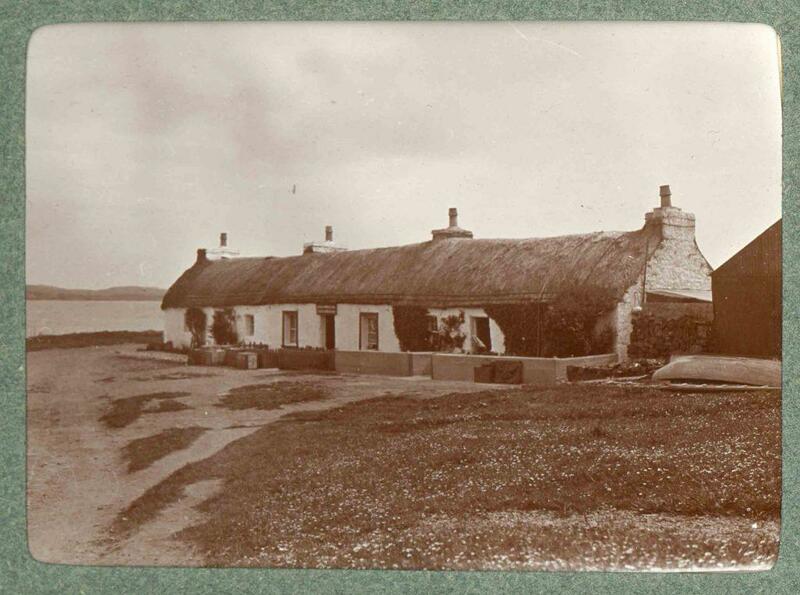 The thatch on the cottages might have gone, however, the building is still there, just up from the pier. Each time I’ve visited Iona the weather has been different. On my first visit it was a glorious sunny day with the sea calm and a beautiful turquoise colour. Second time, it was a really dreach day, damp and misty. On my most recent visit, the weather was dry but overcast, with some short spells when the sun came out. Discussing the weather in Scotland is a national pastime and a subject on which everyone has an opinion. When its dreach and wet for days on end we moan, on the rare occasion that it is very hot we moan! If there is one thing we Scots must acknowledge it’s that we have no power over the weather It’s not unusual for us to experience all four seasons in just one day! I’m sure that I am not the only person, who has visited the Isle of Iona, to have experienced a sense of peace and calm on reaching this famous Isle. If you haven’t already been, add it to your bucket list, you never know the sun might even shine! Your ticket for the: The Isle of Iona – a special place even with the weather!